The process which lead to the first successful airplane is exactly the same process used by NASA engineers today to solve problems. The first step in any new program or project is research. The Wright Brothers first performed a literature search to find out the state of aeronautical knowledge at their time. They wrote to the Smithsonian and obtained technical papers regarding aerodynamics. They read about the works of Cayley, and Langley, and the hang-gliding flights of Otto Lilienthal. They corresponded with Octave Chanute concerning some of their ideas. They studied the problems which had been encountered by previous flyers and they talked about possible solutions to the problems. They looked for answers to the problems of flight by observing large gliding birds. They decided that control of the flying aircraft would be the most crucial and hardest problem to solve and they had some ideas for solving that problem. Today, NASA engineers are involved in all aspects of research. Engineers use the Internet, read books, attend conferences, and use videoconferencing technologies to solve new problems of flight. You can share in this research at NASA Quest, which is hosted by the NASA Ames Research Center. The Wright brothers' ideas for flight control were tested on a series of unpowered aircraft between 1900 and 1902. These aircraft were all flown as kites to obtain aerodynamic performance. 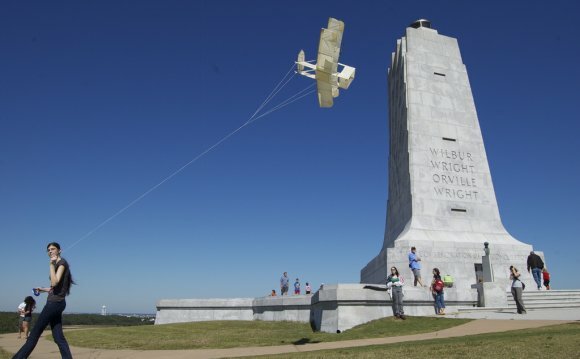 The Wright Brothers were kite enthusiasts and they used the kite flights in the same way that modern engineers use wind tunnels and flight testing to try out their ideas concerning flight control. Kitty Hawk, North Carolina was chosen for their early flight experiments because its consistent high winds off the ocean are perfect for kite flying. The brothers correctly reasoned that a free flying object had to be controlled about all three primary axes; roll, pitch, and yaw. Their aircraft were built with movable surfaces on the wing, elevator, and rudder. Control of the surface shape was in the hands of the pilot. They extensively tested these ideas by glider flights of the aircraft. Today, NASA engineers at the Langley Research Center use sophisticated models and wind tunnels to improve the flight control of modern aircraft. These ideas are flight tested at the Dryden Flight Research Center. The early kite and glider experiments did not meet the performance goals which the brothers calculated before the flights. In late 1901, the brothers began to doubt the data which they were using to design their aircraft. They built a wind tunnel and developed model-testing techniques including a balance to more accurately determine the lift and drag of their aircraft. They tested over two hundred different wings and airfoil models to improve the performance of their gliders. Their very successful 1902 aircraft was based on their new data. Today, NASA engineers at Ames, Langley, and Glenn Research Centers use sophisticated models and wind tunnels to study a variety of problems associated with modern aircraft design. These tunnels and test techniques are only modern improvements on the original work done by the Wright Brothers. You can use a computer simulator of the Wright tunnel to find out how it works. Besides being airplane designers, and test engineers, the Wright Brothers were the first pilots of a heavier than air, powered aircraft. They developed their piloting skills by making over 1000 flights on a series of gliders at Kitty Hawk between 1900 and 1902. At the time of their first powered flight, the brothers were the most experienced pilots in the world. From 1903 to 1905, they continued to perfect their piloting skills on a series of powered aircraft. Today, NASA test pilots at the Dryden Flight Research Center continue the pioneering work of the Wright Brothers. The Wright Brothers were the first to fly a self-propelled, heavier than air machine. This required the development of two other pieces of technology; a light weight motor and the propellers to push the aircraft through the air. The brothers based their engine design on an early internal combustion engine for an automobile. The thin, high speed propellers which they designed were based on wind tunnel tests and were unlike any other propellers being used at that time. While the design of the airframe of the Wright aircraft remained nearly the same for years, the brothers continually improved and upgraded their engine design. Between 1903 and 1913 the engine power increased from 12 horsepower to nearly 75 horsepower. Today, NASA continues to perfect aircraft engines and develop new methods for aircraft propulsion at the Glenn Research Center. It is important to note that the four flights of 1903 were only a chapter in the story of flight. The longest flight lasted less than a minute and did not include any maneuvers. The brothers continued to perfect their machine with a series of aircraft built between 1903 and 1905. They moved their flight testing from Kitty Hawk to their home town of Dayton, Ohio and flew their new aircraft at Huffman's Field on the edge of town. With new, more powerful aircraft, they were able to stay aloft for up to a half hour, to fly figure eights, and to even take passengers up for a ride. The age of the airplane had arrived. Today, NASA Aeronautics Programs continue to develop new ideas to improve aircraft performance and operation.